New Philadelphia Eagles starting quarterback Mark Sanchez has dominated the headlines since the Eagles’ Monday Night Football beatdown of the Carolina Panthers, 45-21. Sanchez finished the game 20-37 for 332 yards, two passing touchdowns, 21.2 fantasy points and two Philly cheesesteaks. While this was Sanchez’s first start since December 30, 2012 and only his second game actually on the field with the Eagles, everyone likes to run with a warm and fuzzy story like this one. 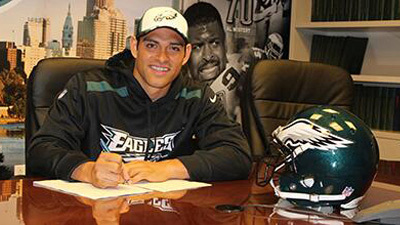 The words “reborn” and “quarterback heaven” have been thrown around a lot whenever Mark Sanchez and the Philadelphia Eagles are talked about nowadays. That would make second year Head Coach Chip Kelly God-like in these scenarios, and while Kelly deserves high praise for his new, uptempo way of doing everything the man is still looking for his playoff win in the National Football League. Sanchez looked solid against a Panthers’ defense that got zero pressure on the quarterback and did not even show up in primetime on Monday night. I say solid because he only completed 54 percent of his passes and finished with a QBR of 61.1 against a team that may never have actually gotten off the bus. Okay, enough bashing the Panthers. Sanchez will definitely have to be better this coming Sunday if the Eagles want to have any chance of beating Aaron Rodgers and the Green Bay Packers at Lambeau Field, and I think he will be. Whether you agree that Sanchez can keep playing this well or not, I believe he is at worst a top ten fantasy quarterback for the rest of the season. Sure it is fun to call Philly “quarterback heaven,” and I am sure Chip Kelly’s system feels that way for Sanchez after what he went through in New York (talk about the Quarterback Circle of Life). People calling it “quarterback heaven” are forgetting a very important word before the word ‘quarterback,’ and that is the word we all care most about: fantasy. The Eagles found themselves up 31-7 with the football to start the third quarter on Monday night and WERE STILL THROWING! If those words aren’t music to fantasy owners’ ears, I don’t know what is. In a game that was over from the word “go,” Sanchez threw the ball 37 times as I said above. The Eagles, who are known for their running game and never really going away from it, rushed the ball only 23 times for 37 yards. Doing some simple math, that means the Eagles ran 60 plays in a game where they should have been trying to kill the clock from the second quarter on! Sanchez looks like a much more comfortable quarterback and has weapons around him that he never came close to having with the Jets. This is a recipe for sustained success. Sanchez threw for over 300 yards in his first start with the Eagles. He had only done that eight times during his previous 62 starts, and that is including a 299-yard game against Cleveland in 2010. Philadelphia’s schedule does not really scare me when it comes to fantasy (as for in real life I am honestly worried the Cowboys could finish with a better record, and that is saying something). The Eagles have four road games (GB, DAL, WAS, NYG) and three home games (TEN, SEA, DAL) left. Since Week 17 does not count in most fantasy football leagues, it is really four road games to only two home games. I picked up Mark Sanchez in every league that I did not have a guy by the name of Peyton Manning because I believe that, for fantasy purposes, just about any quarterback plugged into Chip Kelly’s high speed offense could thrive as long as they do not habitually turn the ball over (that means you, Michael Vick). That is not to knock Sanchez, who is without a doubt more athletic and better at throwing on the run than Nick Foles. At this point in the fantasy season with about three weeks left in the regular season every roster move can give you the slightest advantage over the other people in your league. I would definitely rather have Sanchez on my team than have to face him come fantasy playoff time. This entry was posted in Home, NFL and tagged Carolina Panthers, Chip Kelly, Eagles, fantasy football, Mark Sanchez, NFL, Philadelphia, Philadelphia Eagles, quarterback, Sanchez, The Eagles. Bookmark the permalink. Pingback: Zocco's Modern Life | Where do Eagles, Cowboys go From Here?